In the sixteenth issue of the Bed and Breakfast Traveller, we take you to Regina, Saskatchewan, capital city and heartbeat of the province. Each year, Regina welcomes thousands of visitors from around the world, all of whom come to indulge in the vibrant festivals, elegant culture, and legendary hospitality. The city is even a favorite royal destination, and been called "Canada's Queen City." Ever since Princess Louise christened the small 1882 town "Regina" after her mother, Queen Victoria, the ties with the monarchy have been strong. But Regina warmly welcomes all guests, be they of royal lineage or not. Imagine for one minute 2300 acres of green lawns, winding pathways, and forested groves, all studded with famous buildings and situated around a lake, and you have a perfect mental view of Wascana Park. The park hosts many of Regina's outdoor events, and is the source of activity year round, be it picnicking, swimming, dining, birdwatching, the list goes on. For the sports enthusiast, there is year-round racing at Queensbury Downs, football at Taylor Field, baseball at Currie Field, a multitude of golf courses, and miles of hiking and biking trails. If your interest lies also in the area of sports history, be sure to check out The Saskatchewan Sports Hall of Fame and Museum. Regina is the proud host of Canada's oldest orchestra, the Regina Symphony. When not enjoying one of its performances in the Saskatchewan Center Theatre, you are welcome to take in a jazz concert, live play, or a native/ethnic display of music and dance. One popular feature, presented each year throughout July and August, is the Trial of Louis Riel, held at the MacKenzie Art Gallery. This fall, be sure to check out the events listed below. There's something guaranteed to appeal to everyone's interests, not the least of which is the warm welcome that awaits you in the "Queen City". 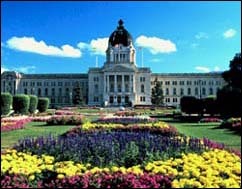 Oct 13-14, Nov 3-4, Dec 1-2: Traditional Victorian Tea served in Saskatchewan's elegant Government House Ballroom. Tea served 1 - 4pm. Advance registration recommended for December dates. November 2-3: Craft sale and art gallery, featuring local and native artists. Held at Banner Hall, Exhibition Park. For more information, call 1-(306)-789-0054. November 9-11: "Our Best To You" art and craft sale. Features Christmas crafts and works from Western Canada artisans. Held at the Agribition Building, Regina. Call 1-(403)-938-8102. November 17 to January 6: SaskPower Festival of Lights. Enjoy a dazzling drive through light park held in Wascana Centre. This scenic tour displays beautiful, illuminated figurines constructed with light bulbs. November 22-25: 26th annual Christmas Craft Market, featuring handcrafted goods and even activities for children. Held at the Regina Sportsplex. For more information, call 1-(306) 653-3616.